We recently bought a dining room table and 4 chairs from Craigslist for our dining room. Once we got it home we realized that 4 chairs was definitely not enough for this table: it’s huge!!! So, we decided the best solution was to create a bench for one side of the table. It would help fill the space and would let us seat a lot of people for dinner parties! My husband claimed he was good at wood working and could easily make a bench. I was only slightly skeptical…but, he pulled it off and our bench is AMAZING. 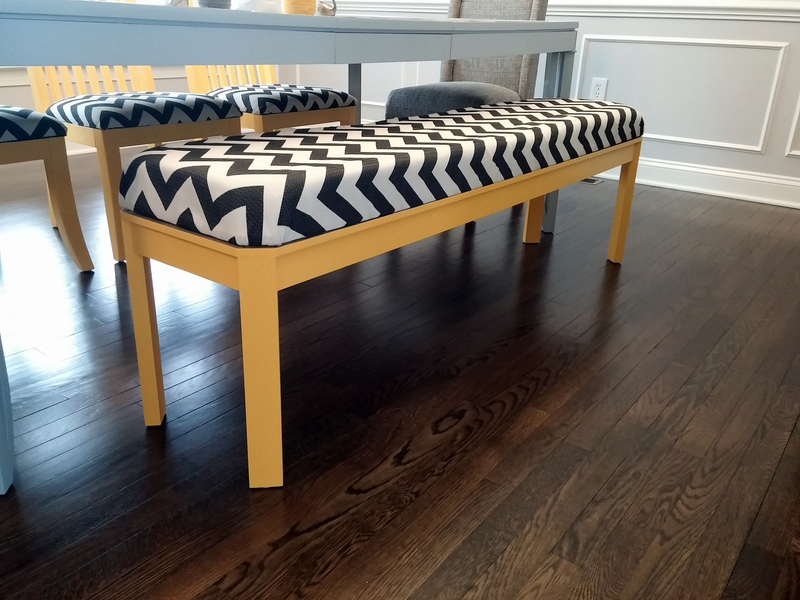 We decided that we wanted to design our bench to match our dining table. Both the dining table & the bench have 45 degree chanfer corners. 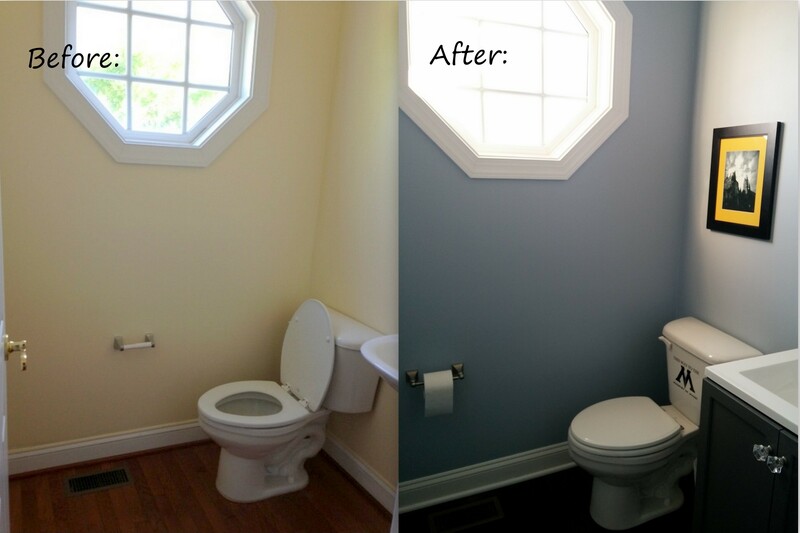 Our (semi) New & Improved Half-Bath! Having a lot of bathrooms in a house is both a blessing & a curse in itself. 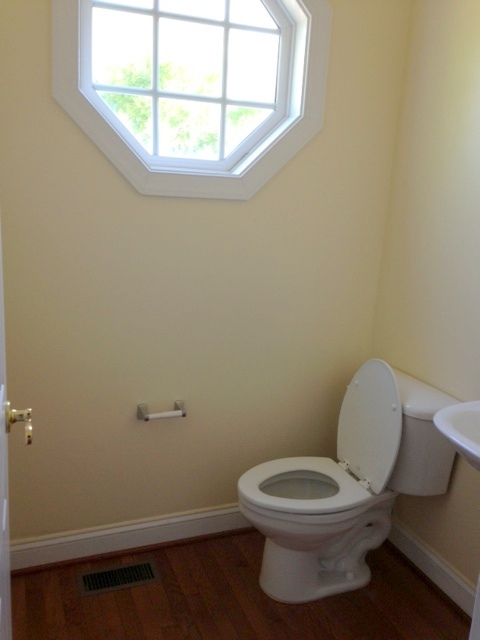 The more bathrooms you have, the more convenient it is, especially for guests. However, cleaning all of those bathrooms is a HUGE pain! Anyways, I love having a half bathroom on our main level for guests to use. But, just like all of the other rooms in our house, we did not like the design that the bathroom had when we bought the house. 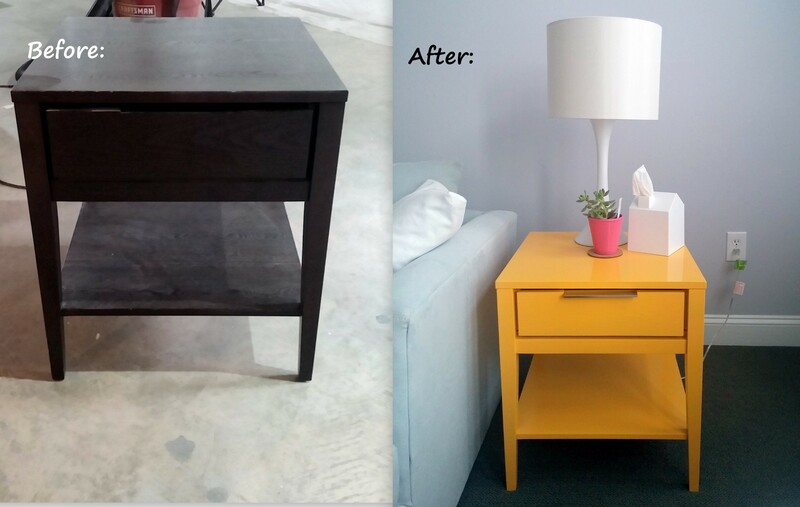 The color was wrong (and the paint job was terrible), and I really wanted to have an actual vanity and not a pedestal sink (I wanted some storage!). 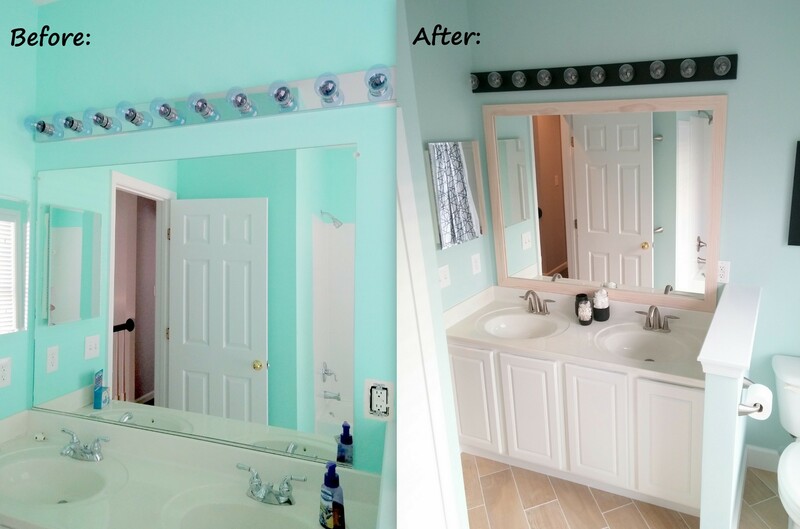 When we first bought our house my husband & I agreed upon this compromise: I could design this half bathroom & the guest bathroom (that is upstairs) however I wanted, and he got to design our master bathroom. 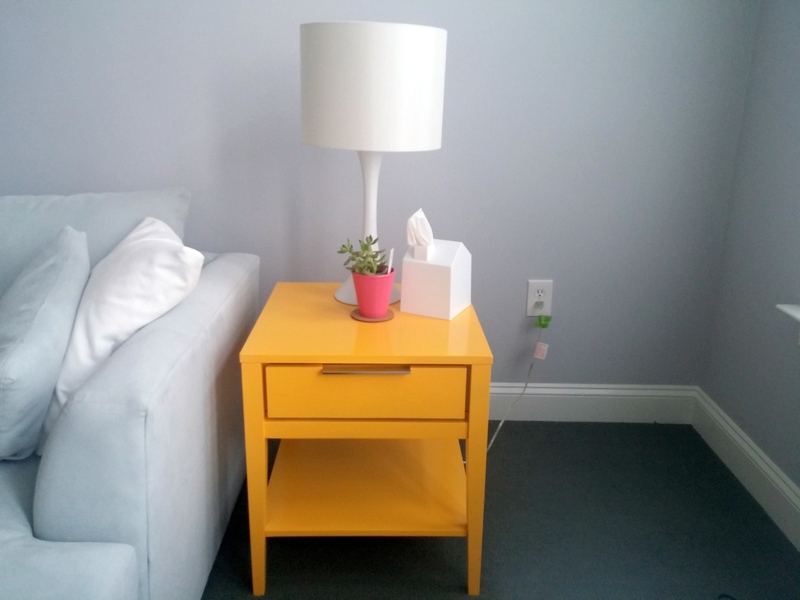 I was really excited about this compromise, and naturally I decided to go with a bold paint color. And naturally, my husband hated it. He complained everyday about the color! He tried to insult it by referring to it as a “90’s color,” but I considered that a compliment since I loved the 90’s! Really, he just thought the color was too dark and wanted something to brighten up the area. The color I had decided to change it to was Wipeout by Behr. I loved how the color contrasted against our dark wood floors & the white trim. Even though it has an ADORABLE porthole window (one of my absolute favorite features in our home), my husband thought that this color was really just too dark and depressing. My husband and I bought a house this past July. It was one of those situations where as soon as we pulled into the neighborhood we KNEW (well, at least I knew) that this was definitely the house for us. The neighborhood was full of Victorian styled homes, and the house itself was full of character. I fell so completely in love as soon as we walked through the front door. That being said, the house needed A LOT of work. The walls were full of dents and holes, and the paint job was pretty terrible (paint & stains on the ceilings, uneven paint lines, paint all over the trim, and multiple stickers & pieces of painter’s tape had been left on the walls in many rooms and the old owners had just painted over them). The kitchen was a space in the house that we just didn’t like any part of it. We didn’t like the color on the walls, the window treatments, the color of the granite counters, and we especially did not like how the cabinet color and the floor color was essentially the same. It just wasn’t our style at all. We soon decided that tackling this kitchen was going to be a top priority once we moved in. We decided to have the wooden floors refinished, repaint the walls, and to paint the cabinets white (in hope that once we made all of those changes we would grow to love our counter tops). We researched how to paint to paint cabinets online, and we also called a lot of different paint stores to hear opinions and advice.